“As a tech hub, Rotterdam urgently needs a more compelling proposition towards talent, founders and investors. London, Berlin, Stockholm and Amsterdam are great examples,” says Ohad Gilad from 42workspace, a tech co-working hotspot in the centre of Rotterdam. “One of the problems is still that there is no good overview of the companies and people involved with tech and innovation in Rotterdam.” Without such an overview of the different companies, people and spaces, it’s difficult to effectively navigate the ecosystem and connect with the right parties. An exhaustive overview is therefore the first step to increasing interaction, network and collaboration. The second purpose of the Startup Finder is to measure and benchmark progress. The more information about startups, scaleups and investment is available, the better the insights of: the overall state of growth, the impact of tech companies, the impact of tech employment and innovation progress of Rotterdam tech companies. This data then serves as a point of reference for future progress and to benchmark Rotterdam against other tech city hubs. Initiator WeTechRotterdam is not the only driving force behind the Startup Finder. With the strong support of R’damse Nieuwe, all of Rotterdam’s coworking spaces, incubators and accelerators are already on board. These initiatives include the likes of ECE, CIC, Venture Cafe, Startup Foundation, YES!Delft, BlueCity, Spaces, Workspot, Kleinhandel, Het Industriegebouw and RDM. WeTechRotterdam is further supported by and collaborating with Gemeente Rotterdam, Innovation Quarter and Startupdelta. The platform itself is powered by Dealroom: Europe’s leading venture capital database. All agree that a better overview is needed, both as reference to benchmark future progress, but also as a means to identify and connect. However, this requires input from all different stakeholders. We call on all stakeholders, from startups, scaleups and investors to individuals associated with coworking spaces, innovation hubs, tech education and more, to claim their position on the map, updating their profile information, and making themselves visible to the rest of the ecosystem. Click here to claim your company on the Rotterdam Startup Finder. About WeTechRotterdam: A city-backed foundation started by Rotterdam entrepreneurs, WeTechRotterdam is a non-profit initiative aiming to boost Rotterdam’s tech ecosystem. Built on three core pillars – education, entrepreneurship and investment, WeTechRotterdam focuses on talent development, stimulates collaboration, knowledge-sharing and interactions through its events and courses, and provides guidance to investors and other stakeholders of the ecosystem. 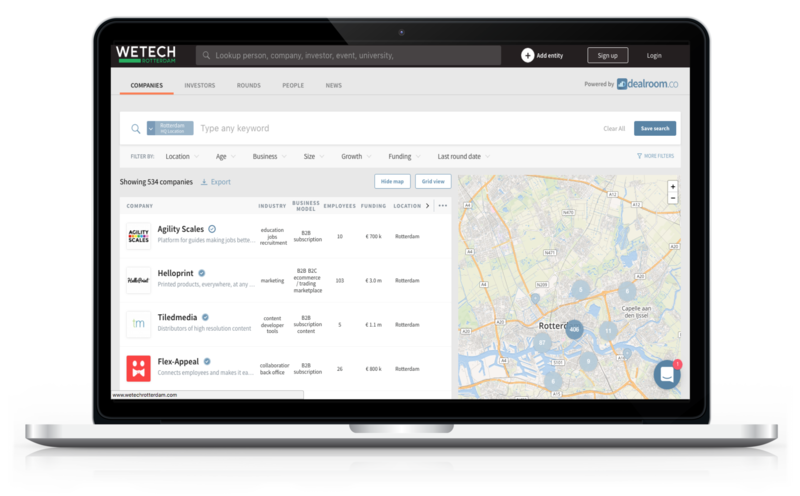 By coordinating the many existing hubs and partner initiatives, WeTechRotterdam acts as an umbrella and as the central landing page for all things related to tech and innovation in Rotterdam. About Dealroom: Dealroom.co is a proprietary global database providing business intelligence about innovative companies, technology and venture capital investment. Dealroom’s clients include world-leading Silicon Valley firms, venture capital and buyout firms, multinationals and governments. Dealroom’s software, database and bespoke research enable organisations to keep at the forefront of innovation and identify growth & strategic opportunities. About Heads of Family: Heads of Family is an informal network of all coworking spaces, incubators, accelerators and innovation hubs around Rotterdam. Given their close contact to the many young startups, entrepreneurs and freelancers, Heads of Family connects an entire network of ambitious companies and individuals.